For over ten years, we helped our clients achieve operational excellence by providing tailor-made IT solutions. A managed solution at Kumina always includes full maintenance of your infrastructure up to your own application including unlimited technical support hours, for a fixed price. 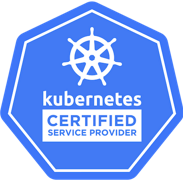 We make sure all aspects of your Kubernetes solution are up-to-date, secure and optimized, so you and your IT team are able to focus on high-value projects with peace of mind. Setting up the most optimal online infrastructure and implementing Kubernetes can be a very complex process. Our extensive experience has taught us that tailor-made solutions are the key to success. Together, we will develop a solution that’s perfectly suited to your needs and wishes. Throughout the process of creating and migrating your new environment, our experts will be available to guide you and answer all of your questions. Our managed solutions include updates and patches for your entire online infrastructure up to your own applications. Our 24/7 monitoring keeps watch for potential issues. With this early warning system, we can solve disruptions quickly, often before you even notice them. Trend analysis and log aggregration help us pro-actively analyse your infrastructure performance and track potential optimisations, improvement opportunities and capacity requirements. This is pivotal to the long term success of any business that operates online. Our services also include in-depth security: multiple layers of security controls throughout your online infrastructure. Our motto is: We do it right, or we don’t do it at all. All our solutions are based on best practices and proven technology, ensuring the best performance, security, compliance and stability available today. Four words say it all: unlimited support and advice. Because you pay us for our results, not for our time. A supplementary 24/7 emergency response line is available, making sure an expert can always be reached in case of emergency. Our dedicated Kumina team will come to know your business from the inside out, making them experts at identifying and meeting your needs. We are always on your side, supporting your goals and collaborating with you to make the right tactical and strategic decisions. You will always be able to talk to a real person. Thanks to our small teams and short communication lines, our experts are just an email or slack notification away. In addition, we don’t do bureaucracy – if you need something, we get to work. Kumina has been a stable partner to us for over 10 years. They always think along with us and are always willing to execute addition activities and go the extra mile to improve our setup. In our experience, Kumina is a no-nonsense organisation. They do exactly as they say, give a high priority to security and they deliver an excellent price / performance ratio. We trusted our online environment to Kumina since it's foundation in 2004. This to full satisfaction. Kumina is very pro-active, without overdoing it. They never cause us to incur unnecessary costs. The few times in the last twelve years when our web servers experienced problems they solved it quickly and appropriately. We would love to hear about your business and projects. Fill out the form and one of our experts will be in touch soon.